The history of rapid-transit began 150 years ago, with the opening of the Metropolitan Railway in London in 1863. In the next century and a half, dozens of architects and engineers have worked on underground tunnels and stations. Some are abandoned now, but others are as good as new. 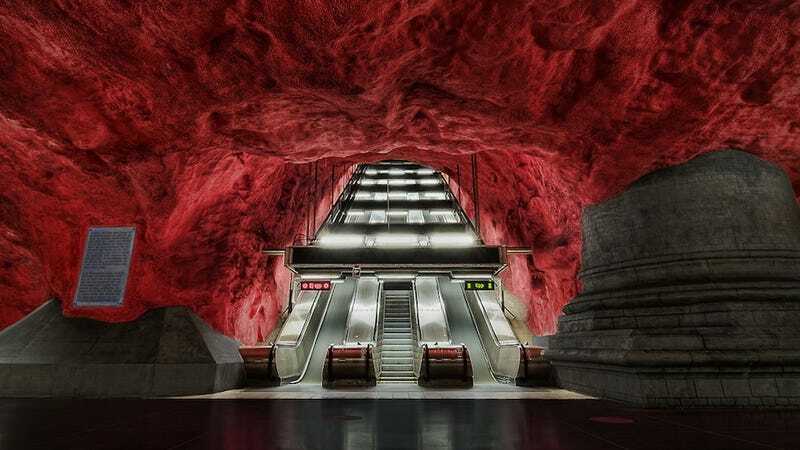 Here are some of the most wonderful underground railway stations. Rådhuset (Court House) station was opened in 1975 as a part of the Stockholm rapid transit system, one of the best examples of organic architecture. Pictured above. The only place where all three of Stockholm's metro lines meet has this really wonderful one platform station, opened in 1975. This station was opened in 1998, but the 11 large lamps (with red, blue, and yellow lights) were installed three years later. Marienplatz Station is one of the most frequently used stations in Munich, and was opened as part of the new S-Bahn network for the 1972 Summer Olympics. Olaias Station was designed by Tomás Taveira and opened shortly before the Expo 1998. Walk through the station on 360cities. This station was opened in 1968, but was completely renovated between 2007 and 2009 with GRC (Glass Reinforced Concrete) panels and interesting details designed by the Barcelona-based ON-A Architects. This highly ornate white marble station was opened in 1955 and designed by Y. A. Levinson. Elektrozavodskaya Station was named after an electric light bulb factory nearby and opened in May 1944 during the WWII. It's famous for its decorations, designed by Vladimir Schuko, Vladimir Gelfreich and Igor Rozhin. Opened in 1952 and designed by Alexey Shchusev and Viktor Kokorin, this station has some mosaics, red granite, marble and other artistic decorations. The richly decorated hall was opened in 1954 and has a quasi-baroque style with large mosaics by A.V. Myzin and gold-colored trim. The station, designed by S. Volovich and opened in 2008, has green Cuban marble on the walls, and grey granite with darker (Gabbro granite) marble edges. The Orthodox cathedral-like Zoloti Vorota was opened on December 30, 1989 as the part of the first stage of the Syretsko-Pecherska Line. Designed by Boris and his son Vadim Zhezherin, S.Adamenko, and M. Ralko. Many foreign tourists were allowed to travel only between Puhŭng Station and Yŏngwang Station (both opened in 1987) on the Chŏllima Line. The Pyongyang Metro is the deepest in the world–the track runs 360 ft (110 m) underground. This station was redesigned by Diamond and Schmitt Architects in 2008. This station, with its curved and luminous walls made of glass, is located at O'Hare International Airport. It was designed by Murphy/Jahn and opened in 1984. The steampunkish underground station near the Musée des Arts et Métiers was opened in 1904, but was redesigned by the famous Belgian comics artist François Schuiten in a style inspired by the works of Jules Verne. This transfer station was built for the 2009 World Games, but opened in September 2008. It has the largest glass work in the world, designed by Narcissus Quagliata, covering an area of 23,465 sq ft (2180 sq m) with 4,500 glass panels. The colorful opened Dalek skirts with hemispheres on the walls make these stations from the 1970s look really fantastic. The construction was finished in 1986, but it was expanded in 2001 under the leadership of Zbigniew Peter Pininski.